US Army's Camel Corps, History's Most Successful Failure. In May of 1856, at Powderhorn, Texas, the US Army's most successful experiment in overland transportation before the development of four-wheel-drive vehicles powered by internal combustion engines began. By the end of May, 1866, the experiment was dead. The idea of using camels as overland transport in the deserts of the American Southwest was the brainchild of then US Secretary of War Jefferson Finis Davis. Horses and mules, the Army's only transportation at the time, had to be fed on corn or grain to stay alive and functioning, and had to have water on a daily basis. Neither was readily available in the vast reaches of the Southwest. Camels, however, were desert animals. They could survive, even prosper, on desert vegetation. Though they required tremendous amounts of water when they drank, they could go days without drinking, hence they could cross the vast distances between water supplies in the desert without dying of thirst. As beasts of burden, they could carry far more than the 300 lbs that was considered a 'mule load.' They were simply ideal for the purpose-making regular routes across the desert Southwest an actuality rather than a remote possibility. Jefferson Davis realized this in 1855 and sent a delegation from the US Army to the Middle East to observe and report on the feasibility of using camels in the American deserts. The officers reported seeing camels being used in every environment from the Sahara to the Alps, carrying loads that would crush even the biggest mules, and making trips between waterholes in deserts that would leave horses and mules dead of thirst. Camels were ideally suited, they reported, for the American Southwest. Davis authorized the purchase of some 30 camels and their transport to the United States. A problem arose. Camels needed handlers, and none of the officers or men of the delegation were competent to handle camels. 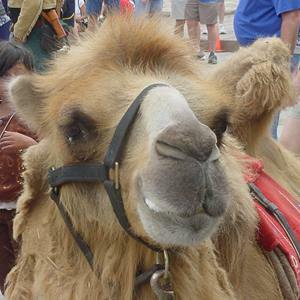 Camels can make even the most stubborn of Missouri mules seem submissive, if improperly handled. As a result, a number of camel-handlers were employed. They included Christian Syrians and Lebanese, as well as Muslim Arabs. One of the former, a man whose surname was Calease or Kalease, eventually married in Mexico. His son, Plutarco Elias Calles, served as President of Mexico in the 1920s. Another, a Muslim Arab, remained in Arizona, where he is remembered as 'Hi Jolly' (Haj Ali) one of the most beloved characters in early Arizona Territory history. 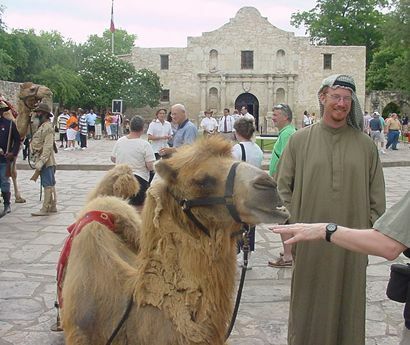 While at sea between the Middle East and Powderhorn, Texas, one of the female camels- they are known as 'cows'-gave birth, so the expedition landed with one more camel than it left with. Immediately upon landing, a discovery was made. Camels frightened horses. This was considered a mixed blessing. While US horses and mules would have to be trained to accept camels-which might take some time-Indian horses would certainly shy away from these strange, ungainly-looking beasts, making camel caravans across hostile territory far safer than wagon trains. Almost immediately tests began to find the animals' capabilities and limits. Of capabilities they had many, but they seemed to have no limits. They were observed eating-and apparently relishing-the foliage of Texas mountain cedar. No other animal would touch it. On one notable occasion, the camels made a freight haul from the supply depot in San Antonio to Camp Verde in a driving rainstorm that would have halted wagon freight operations for days, until the ground dried enough for wagons to move without bogging down in the mud. Eventually a long overland trek was organized, from Camp Verde to California. The camels not only carried freight and supplies for the troops, they carried corn and grain for the horses as well. The camels ate-and apparently relished-the foliage of the creosote bush, also known as 'greasewood.' Nothing else would eat greasewood leaves. While in California the camels were used to rescue a snowbound wagon train high in the Sierras. Time, unfortunately-in the persona of American politics-caught up with the camels. In 1861 the Southern states seceded and Jefferson Davis was elected President of the Confederacy. 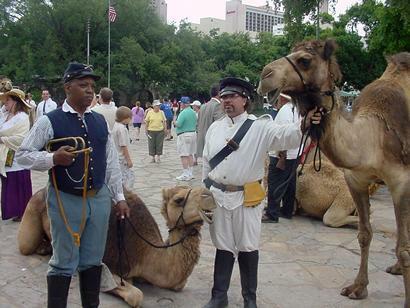 The camels, based in Texas, were in the possession of Davis' government, but there was little use the Confederacy could make of them. Once the Confederacy surrendered, anything with Jeff Davis' stamp on it was anathema to the Union. The Camel Corps was a Davis idea. Therefore it cannot have been good. Of course, a purely West Point-trained officer corps in the Army and the US Cavalry Corps were also Davis' ideas, and they weren't dispensed with. However, the Camel Corps was a distinctly visible Davis innovation that could be disposed of with some publicity. The camels were sold at auction. An Austin attorney bought at least one, which he used for transport between Austin and San Antonio. He took his breakfast at Austin's Driskill Hotel, mounted his camel, and arrived in San Antonio in time for opening of court at 9 AM-some 70 miles to the south. Many fictions were concocted to justify the dismantling of the Camel Corps. One was that the rocky desert of the American Southwest cut the feet of the camels so badly that it rendered them useless. None of them were true. The camels were, without question, ideally suited for the purpose for which they were imported. Only the fact that the man who decided to organize the US Camel Corps later became the President of the Confederate States of America rendered them unpalatable to the post-War Between the States US Army. Politics, not unsuitability, killed the Camel Corps. As a sidenote, some of the camels were simply released to wander in the deserts. In the mid-1870s one wandered into Fort Selden, New Mexico Territory. The young son of the post commander saw it and ran, terrified, to hide behind his mother. The post commandant was COL Arthur MacArthur. The terrified child grew up to be General of the Army Douglas MacArthur. 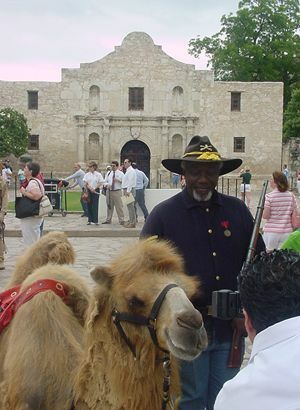 Doug Baum of the Texas Camel Corps with friend.